Pierre Krähenbühl, the commissioner-general of the United Nations Relief and Works Agency for Palestinian Refugees (UNRWA), said in a briefing in Cairo on Monday that continuing to operate the organisation's programmes was the "best response", despite the recent US decision to cut funding. "I couldn't imagine going back to our students and telling them we don't have the money," said Krähenbühl. In August, UNRWA schools in the Gaza Strip, the West Bank, East Jerusalem, Jordan, and Syria opened on time despite a huge budget deficit caused by the decision of US President Donald Trump to cut its funding for the agency, which is worth $300 million. UNRWA also continues to offer health and social safety programmes for roughly 5.3 million Palestinian refugees in the same areas, but, according to Krähenbühl, are "at risk" due to the decision of the US, the historically largest donor to the UN body. Krähenbühl said that the UNRWA, so far, has managed to collect only half of the total amount, causing considerable "stress and pressure" to find a suitable means for ending the agency's financial crisis amid a $200 million budget deficit. Krähenbühl is in Cairo for a two-day visit where he met with the Arab League chief Ahmed Aboul Gheit earlier on Monday, and will be attending the 150th ordinary session of the Arab League Ministerial Council on Tuesday. He described these meetings as "important at this critical moment" to deal with the "unprecedented financial crisis." Krähenbühl noted that the UNRWA has previously faced other crises, including the ones caused by the Lebanese civil war, but that the financial implications of this current one has never been experienced before. 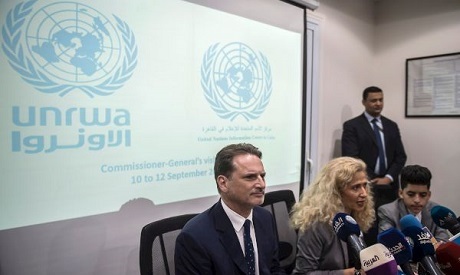 The UN official said that "we [UNRWA] want to reach out" to members of the Arab League during Tuesday's session, such as Saudi Arabia and the United Arab Emirates, who have already pledged $50 million each to help cover the UNRWA's shortfall, and Kuwait and Qatar. Calling on other states to start considering similar moves, Krähenbühl added that nations such as India, China and Japan, in addition to some "generous funding" by the European Union, have also stepped up and increased their funding to the agency, though he did not provide actual figures. He noted that "this is why the Arab League is so important for us" as it helps in mobilizing support for UNRWA, referring to the League's role, as an example, in winning the support of China. In July, Mohanad Al-Aklok, a senior diplomat in the Palestinian delegation in the Arab League, told Ahram Online that Chinese President Xi Jinping informed Palestinians that Beijing will also increase its financial support to UNRWA, without specifying the amount to be pledged, while the Arab states, Japan, and Russia also showed willingness to support the organisation. These developments happened during the recent China-Arab States Cooperation Forum (CASCF), which was established in 2004 by the former Chinese President Hu Jintao with the 22-member states of the Arab League, during the Chinese leader's visit to its Cairo headquarters. Krähenbühl praised the Arab countries that are backing the UNRWA, specifically referring to the efforts of Egyptian Foreign minister Sameh Shoukry and Jordan's Prime Minister Ayman Safadi. During a meeting with Krähenbühl on 30 August, Safadi said that Amman will lead a fundraising campaign for the UNRWA. "The continuation of the UNRWA's mission means continued commitment by the international community to working towards a just solution for the refugees that guarantees the right of return and compensation," Safadi said. Krähenbühl said that a UN meeting, which Jordan and Sweden called for, will soon take place to discuss solving the crisis. He called on the international community "to protect humanitarian funding from politicization", arguing that "political reasons" were behind the US decision to cut funding. "We always deal with politics as a humanitarian organization," stated Krähenbühl. For example, he unveiled the presence of a debate at the "negotiating table" about the definition of a Palestinian refugee, stating that some parties to the crisis, without giving further details as to whom, question whether the sons and daughters of "Palestinian refugees" deserve to have the same status. "I have worked in conflict zones for 27 years. I've never met a refugee who wants to be a refugee. I haven't also met a refugee who wants to continue as a refugee," said Krähenbühl. Krähenbühl also stated that he believes that no state has the right to object to these matters, for the decisions of the UN General Assembly historically led to the establishment of the UNRWA and defined the term "Palestinian refugee". By virtue of the UN General Assembly Resolution 302 (IV) of 8 December 1949 that was issued after the 1948 Arab-Israeli war, the UNRWA was created to "carry out direct relief and works programmes for Palestinian refugees."